Pics and video NASA has discovered a mini solar system of seven Earth-sized planets orbiting a small cool dwarf star, including three within the Goldilocks zone where liquid water is possible. Last year, a telescope in Chile – dubbed the TRAPPIST aka the TRAnsiting Planets and PlanetesImals Small Telescope – spotted two planets orbiting an ultra-cool white dwarf star. This diminutive star has about eight per cent of the mass of our own Sun. 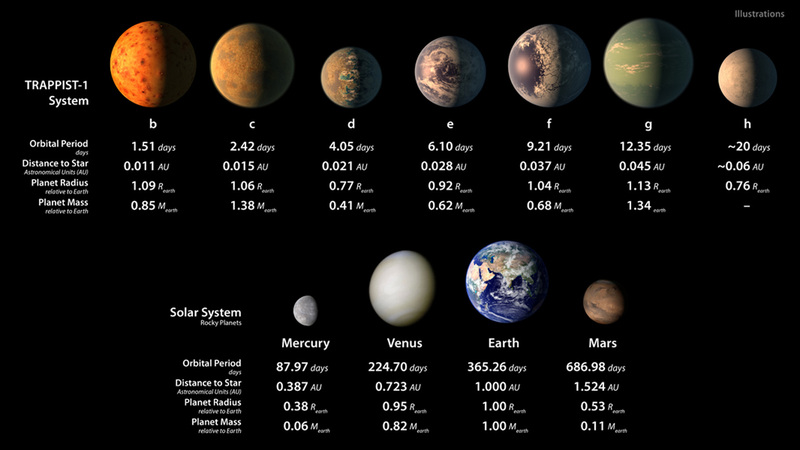 After refocusing the Spitzer and Hubble space telescopes on the dwarf system, the astroboffins identified seven distinct planets. Today they've gone public with their findings. "The seven wonders of TRAPPIST-1 are the first Earth-size planets that have been found orbiting this kind of star," said Michael Gillon, lead author of a paper detailing the discovery, and the principal investigator of the TRAPPIST exoplanet survey at the University of Liege, Belgium. "It is also the best target yet for studying the atmospheres of potentially habitable, Earth-size worlds." Cool dwarf stars are more common than our own type of star, but they weren't considered good candidates for spotting exoplanets because they don't put out much visible light. They do, however, put out a lot of infrared light. This was perfect for Spitzer and enabled the telescope to measure the planets as they were passing in front of the star. The system has been named TRAPPIST-1 after the Chilean telescope. Of the three planets in the system's habitable zone, the innermost, TRAPPIST 1e, is the closest in size to Earth and would get around the same level of sunlight from its dwarf as we do from our Sun. Planet 1f is slightly larger than Earth, has a nine-day orbit and gets about as much light as Mars, while Trappist 1g is the largest of the seven – about 113 per cent of the size of Earth. All of the planets are very close to the dim star they orbit, which means they are tidally locked like our Moon and so have one side in permanent darkness. They should also be water-rich, since they would have formed much further away from their sun and then fallen inwards, Gillion said. The embarrassment of riches around TRAPPIST-1, and the type of star itself, has raised hopes that there may be many more Earth-like planets in habitable zones than first thought, said Thomas Zurbuchen, associate administrator of the Science Mission Directorate at NASA headquarters. "While only three of the planets are in the right zone for liquid water, you could also find liquid water on any of the seven, with the right atmospheric conditions," he said. "Finding a second Earth is not just a matter of if, but when." Next year, when the much-delayed James Webb telescope finally lifts off, it will have TRAPPIST-1 as one of its first targets. The enormous power of the telescope will enable astronomers to see into the atmospheres of the planets and look for evidence of oxygen, ozone and methane – considered possible signs of life – and will also calculate their temperatures. Because the planets are so close together, if you were to stand on the surface of one, you'd see the other six looking as large or larger than our moon. NASA has designed a travel poster for the system just in case – but getting there to check out the view could take a while. The system is located about 39 light years away from Earth, so we won’t be seeing a probe there in our lifetimes, even if the Starshot program is successful. Nikole Lewis, astronomer at the Space Telescope Science Institute, pointed out it would take 44 million years to get there at the speed of a standard jet aircraft.